Come out to any of our local parks on Saturday, April 21 to clean and green for spring! Starting at 9 AM and going until 12 noon, volunteers will be at Horner, Ravenswood Manor, Buffalo, Sunken Gardens and Jacob Parks to help in the clean-up. 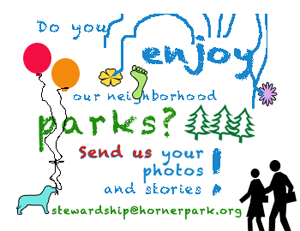 This annual event allows neighbors to help steward a local park, and help to repair our local ecology from the throes of winter. T-shirts will be available on a first-come, first serve basis. Bring gloves, rakes, wheelbarrows, garbage bags, and determination to help make our parks cleaner and safer for all park users.